We spent Christmas in Pitlochry, and after brunch on Christmas Day we went for a walk around Loch Faskally. 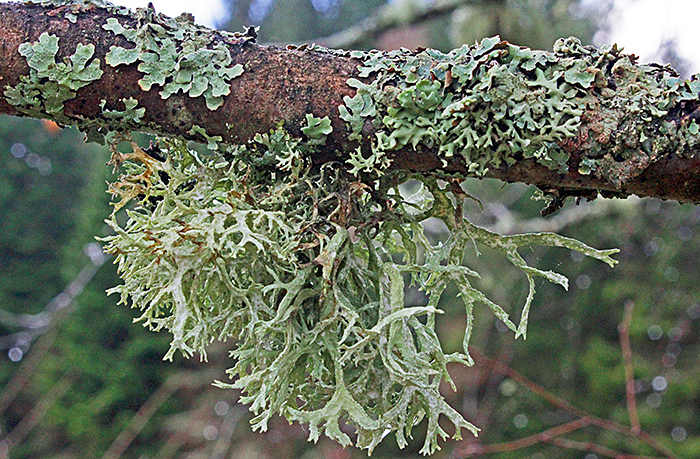 It was cold (just above freezing) and damp, and lots of the trees looked green from a distance, but the colour was not from leaves, it was from lichens. There had been a lot of snow about 10 days before we arrived, and there were still some patches. I didn’t take any notice of white stuff on the ground until a local lady saw me photographing lichens and asked if I knew what the white fungus on the ground was. 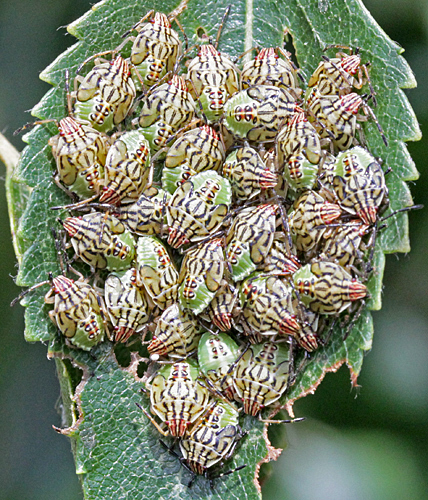 It was growing on fallen branches, and we later saw it on trees as well. I didn’t recognise it, but I took some photographs. 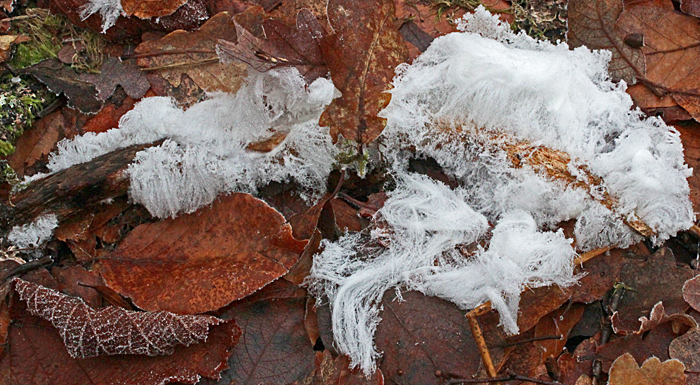 Back home, I tried to identify it, and I am fairly sure that it wasn’t a fungus, but something much more interesting, hair ice. 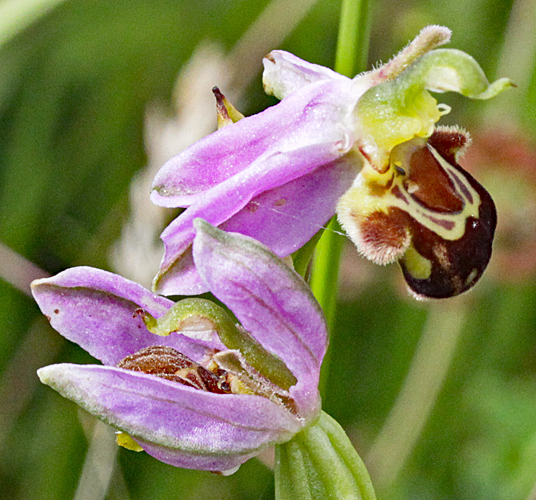 This is associated with the fungus Exidiopsis effusa Bref. 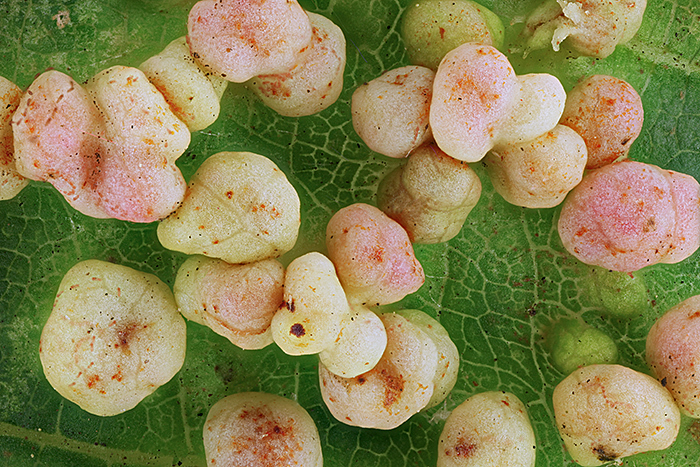 and grows on damp, rotting wood during the night at temperatures close to 0°C. 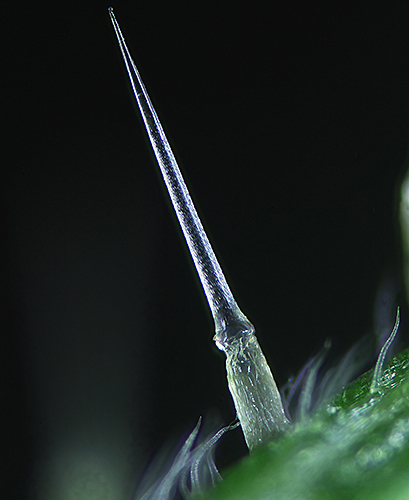 The ice hairs have a diameter of about 0.02 mm and contain small amounts of lignin and tannin that stabilise the crystals. 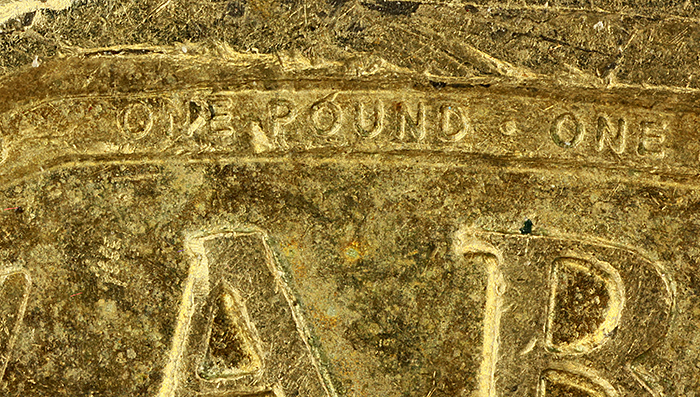 At the workshop for Arkwright Scholars, Quekett members are supposed to teach the Scholars about microscopy, but this time I learned something too: there is micro writing on the bi-metallic £1 coins. It is so small (the letters are about 0.25 mm tall) that I cannot see it without a magnifying glass, but I managed to photograph it when I got home. I used my Olympus Zuiko 38mm f/2.8 Auto-Macro Lens at f/4, at a magnification of 5× on the sensor of my Canon EOS 5D Mark II. 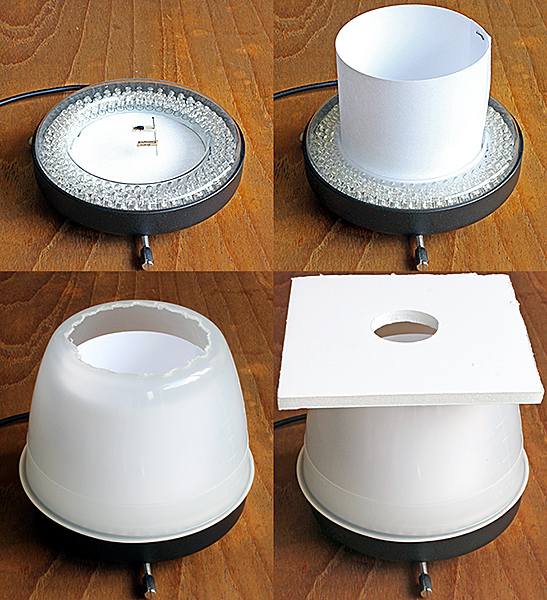 Lighting was two desk lamps with compact fluorescent tubes, diffused through parts of a foam cup. 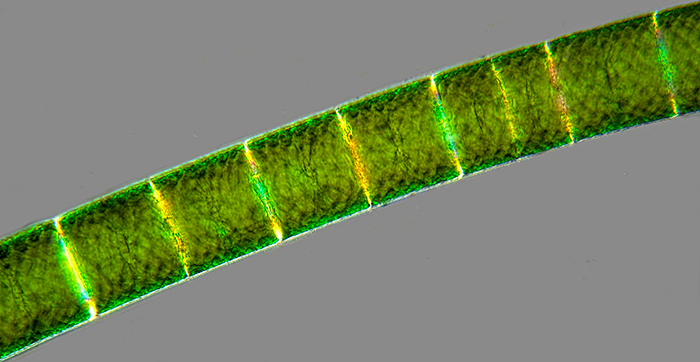 I stacked 25 images, taken at 40 µm steps, in Zerene Stacker using PMax. 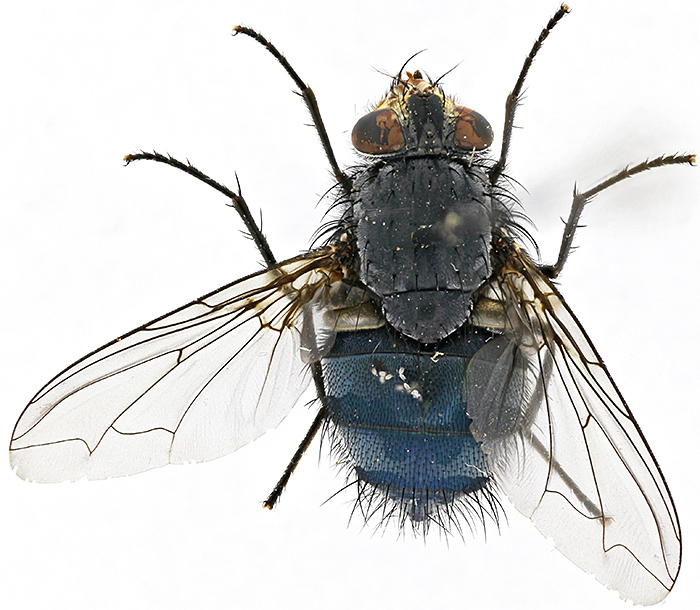 You never know what will turn up at Microscopium. 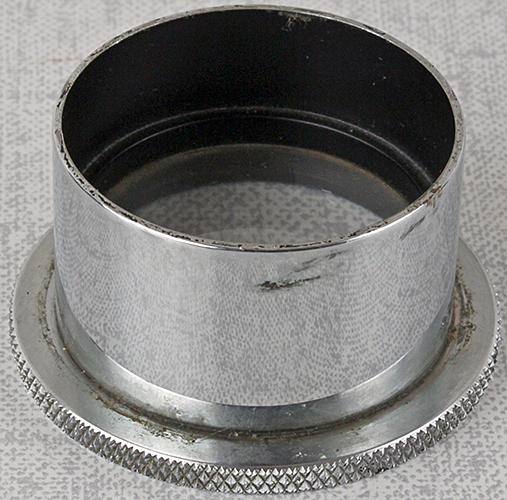 Lots of people have wondered if it is possible to make an adapter to allow the Olympus BH-2 to accept condensers for a conventional sleeve fitting. 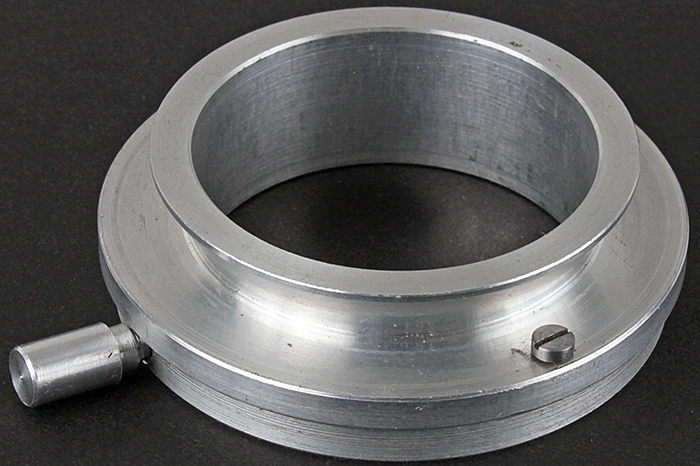 It turns out that it is possible, and I now own an adapter for using condensers that fit a 39 mm sleeve. Sadly, when I tried the Abbe condenser from my Watson Kima, the top of the condenser was about 3 cm below the surface of the stage, much too low to provide proper illumination. 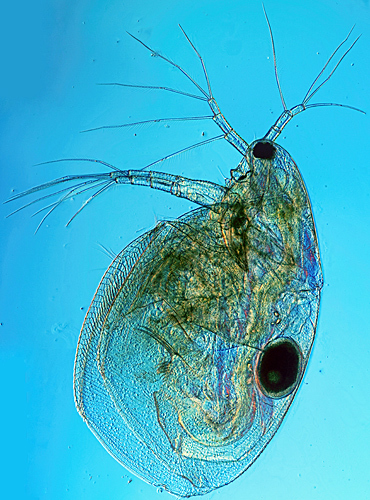 However, also at Microscopium, I found a 39 mm low-power condenser with just a lens, no iris. This works beautifully with my low-power Olympus SPlan FL 2× objective; I can focus the field diaphragm for Köhler illumination and the field of view is clean right to the edge with WHK 10x/20 L eyepieces. It performs better than my BH2-SC condenser with the top swung out, which cannot focus on the field diaphragm and does not quite fill the field of view. Not much time to prepare for the Annual Exhibition, but to counter the almost universal use of LEDs I took the lighting that I used before LEDs, my Schott Fostec DCR-III fibre-optic light source with a ring light, a gooseneck and a light panel. 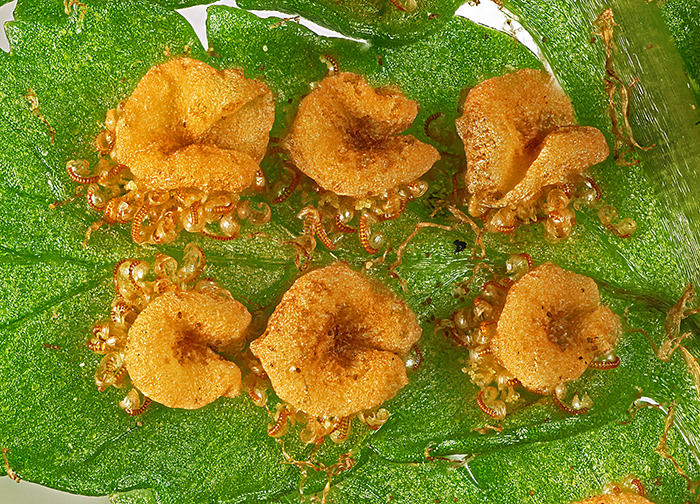 I used my Olympus SZ4045 stereomicroscope and specimens including sand from Sharm Obhur in Saudia Arabia (given away at Penkridge by Robert Ratford), stained slides, fern sori and pear leaves with a fungal gall, European pear rust, caused by Gymnosporangium sabinae Oerst. 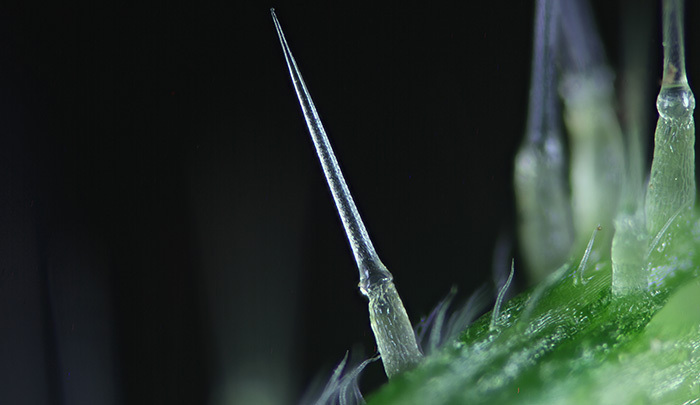 Back in August 2014, I took a photograph of nettle hairs for the report on the I-Spy day at Warnham Local Nature Reserve. I submitted it for the 2014 Annual Exhibition, but it was not selected. I have always liked the picture, so I thought I would have another go for the 2018 Annual Exhibition, and this time I cropped it differently. 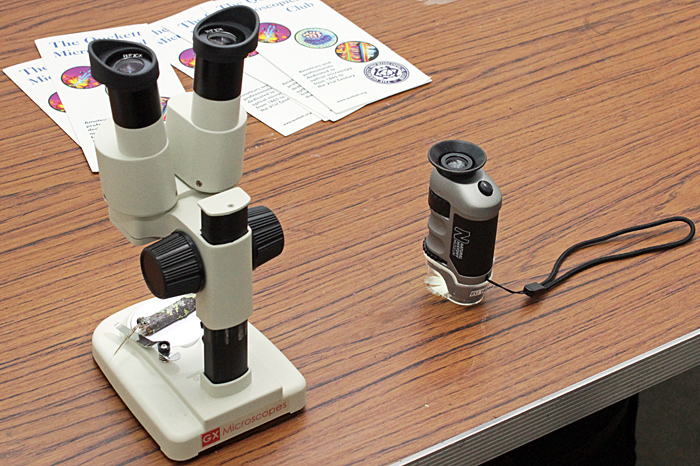 Lots of families go to the Open Day on Wimbledon Common, so I took 2 small microscopes suitable for children, the Natural History Museum Pocket Microscope and a small 20× stereomicroscope that is available from several eBay sellers. To demonstrate them I used specimens from the Common, including a feather and lichen on a twig. 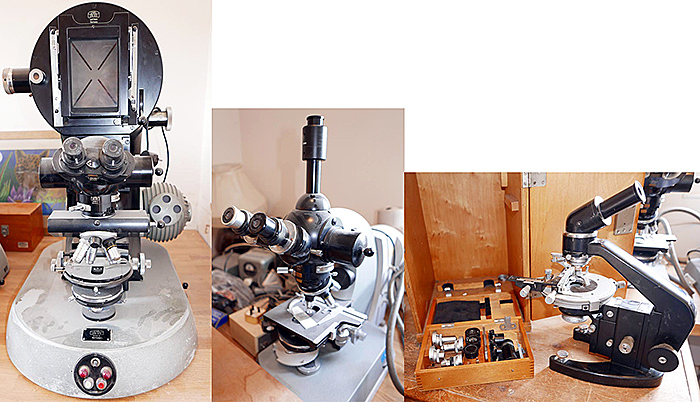 I receive all of the messages sent from the “Contact the Club” form on the website, and one of the most frequent questions is what to do with microscopes left by someone’s father or grandfather. 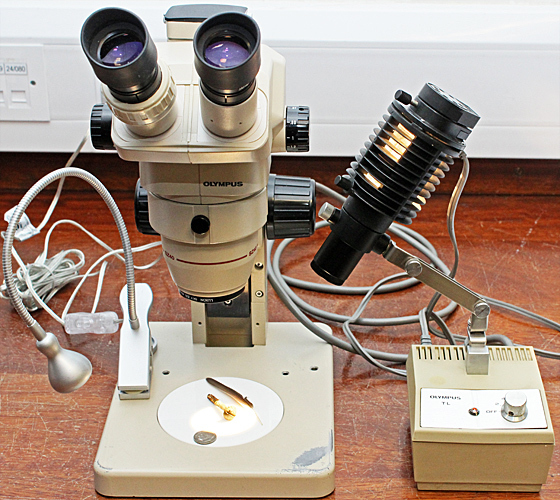 This month there was a very unusual request from a lady in Devon whose late father (Alastair Smith) had asked that his microscopes be given away to Quekett members. 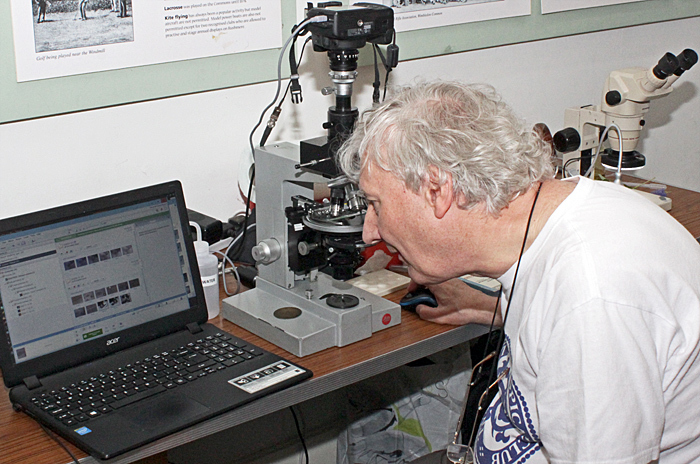 I asked for photos and was amazed to see 2 Zeiss Ultraphots, 4 Zeiss Universals, a Zeiss Photomicroscope, a Vickers polarising microscope and a Lomo MIN-10 polarising microscope. 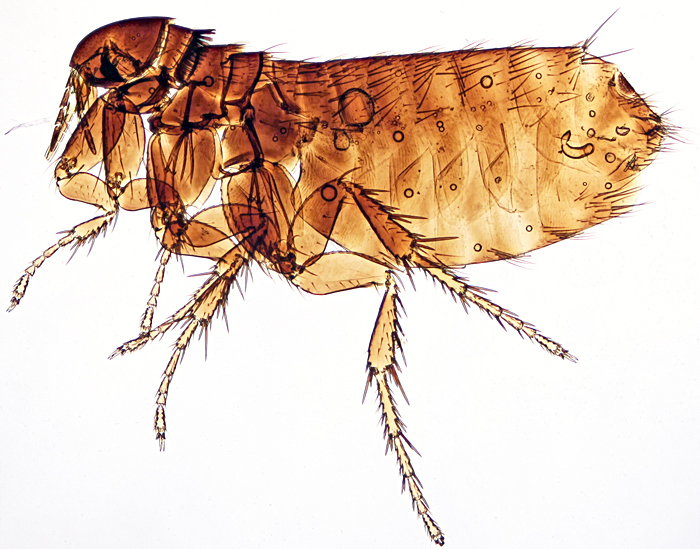 The house needed to be cleared so I contacted as many members as possible by e-mail and set up a page on the website where the microscopes could be examined and then requested at a set time; they were nearly all claimed within a few seconds. 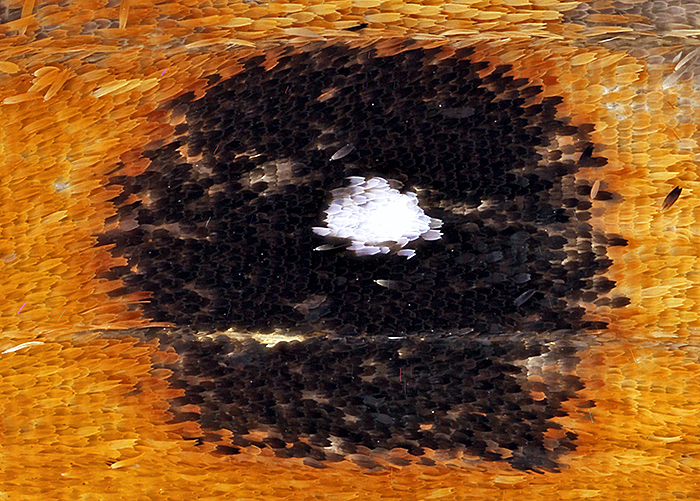 The indoor meeting this month was a gossip on “Slides of stained specimens”. 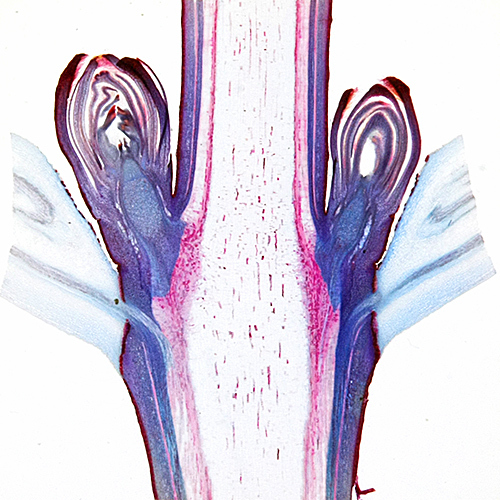 My collection of slides is very modest by Quekett standards, but I found some colourful and unusual ones to take. 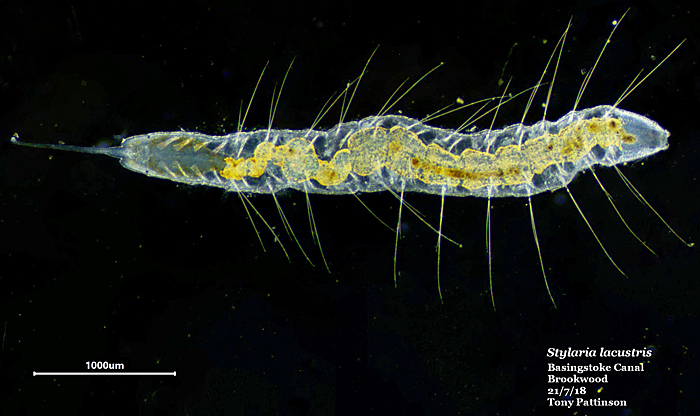 Anodonta sp. (swan mussel) T.S. I photographed my slides during the meeting, using my Canon EOS 40D camera with the Canon EF-S 60 mm macro lens at about 1:1. To support the camera, I used an Olympus Handy Copy Stand, with an LED stage plate intended for a stereomicroscope to provide transmitted light. 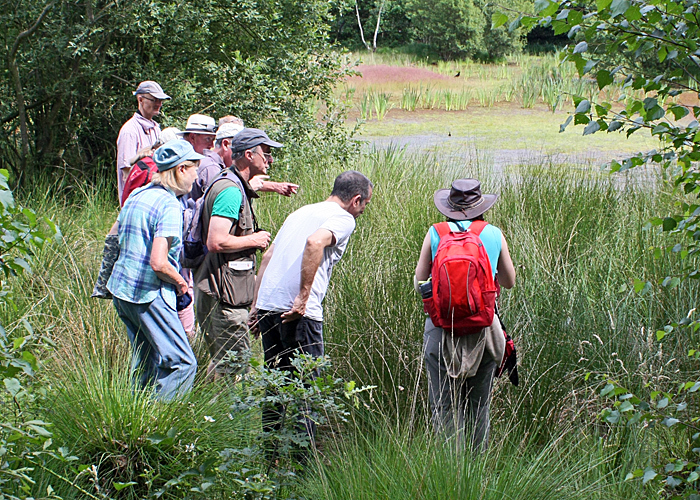 There was also an excursion this month, to Warnham Local Nature Reserve. Quekett members almost filled the Visitor Centre, and our efforts to promote the Club on Facebook started to produce results with 2 visitors. I was worried about my breathlessness so I didn’t take a microscope, and concentrated on taking photographs and making notes for the report. 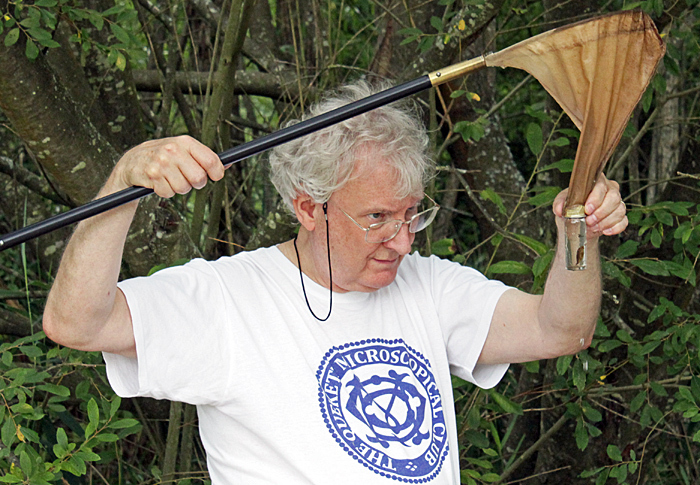 After the long dry spell, some of the ponds and the scrape had dried up, but others still had water and specimens. The indoor meeting this month was a gossip on “Home-made or improvised equipment for microscopy”. No time to prepare anything new, so I repeated my demonstration from the 2017 Annual Exhibition, showing how to use an LED ring-light to produce either shadowless or dark-ground illumination for a stereomicroscope or macro photography. 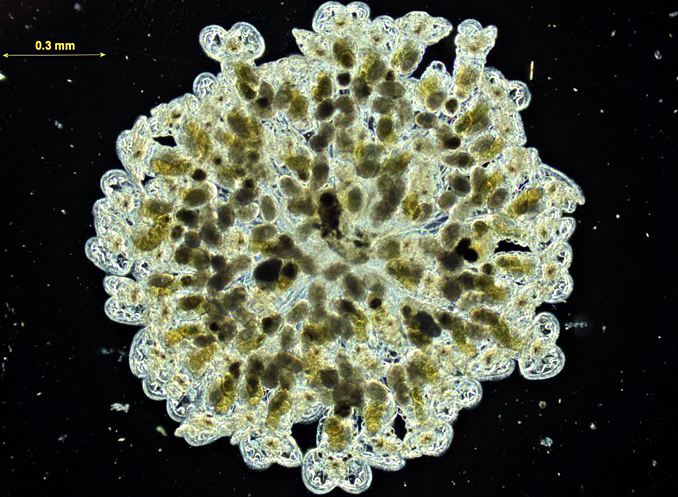 Shadowless illuminator, showing (top left) specimen pinned into a Plastazote disc, (top right) ring of white paper, (bottom left) inverted bowl with base removed, and (bottom right) the complete illuminator. I have started getting breathless for no apparent reason, so I am going to cut down the weight of equipment that I take to meetings. 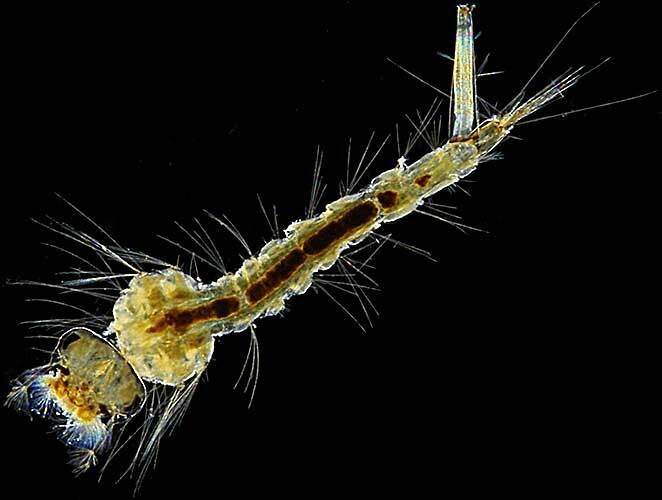 It feels strange not to take a microscope on an excursion. For the Basingstoke Canal excursion we have a spacious hall, not cramped like Wimbledon Common or Warnham, with plenty of room for experts including Chris Algar, David Linstead, Graham Matthews and Tony Pattinson. The June meeting was a gossip on “Hand lenses & their uses” and members brought an astonishing range, including expensive custom-made ones, cheap Chinese ones with built-in LEDs, and ones from school days. 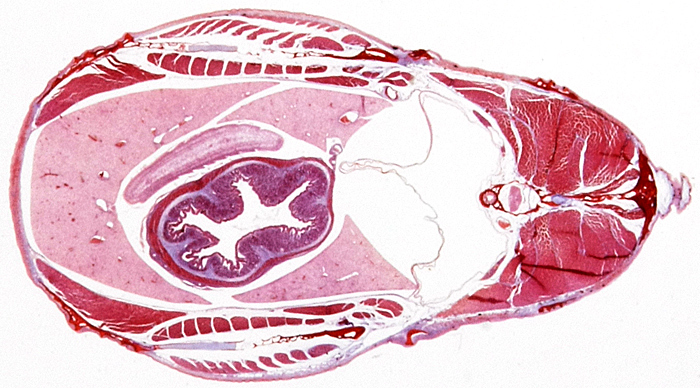 I showed 5 lenses, including my favourite, a folding 8× Gowlland from the dissecting kit I bought in 1964 for A Level zoology. 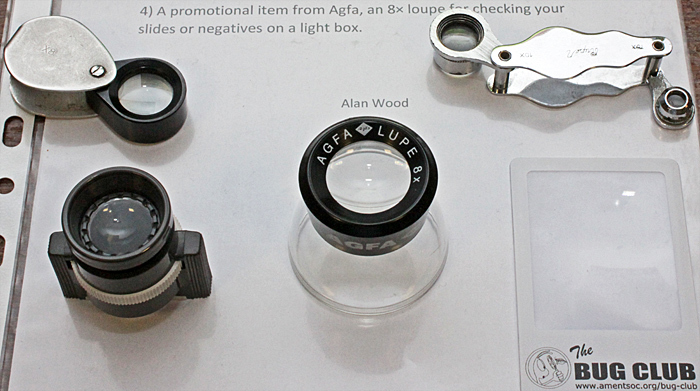 The others were a small folding Japanese Ruper with 10× and 15× lenses (used by my father for examining his stamps), a German 10× achromat with a focusing mount and measuring scale in 0.1 mm intervals, a promotional 8× Agfa loupe for examining slides or negatives, and a promotional Fresnel lens from the AES Bug Club. 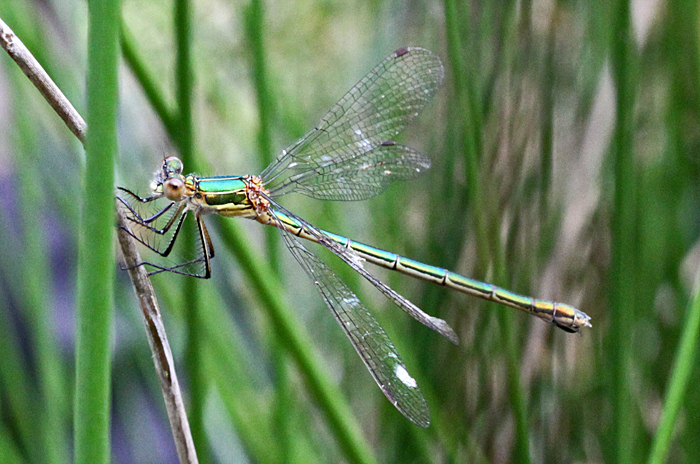 Quekett members went to Wimbledon Common again, this time as part of the outreach programme to support their BioBlitz. 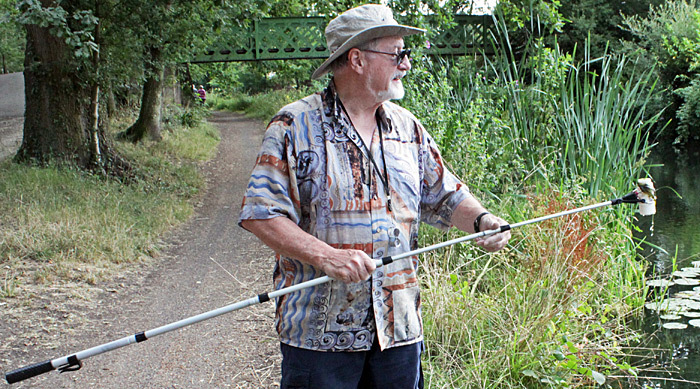 The organised walks are always interesting, with a range of experts on hand to point out and identify interesting organisms and tell us about them. This time, I tried using 2 Canon EOS digital SLR cameras, one with the 18–55 mm zoom lens and the other with the 60 mm macro lens and Yongnuo YN-14EX Macro Ring Lite. It is quite a lot to carry, but I got some nice photographs. 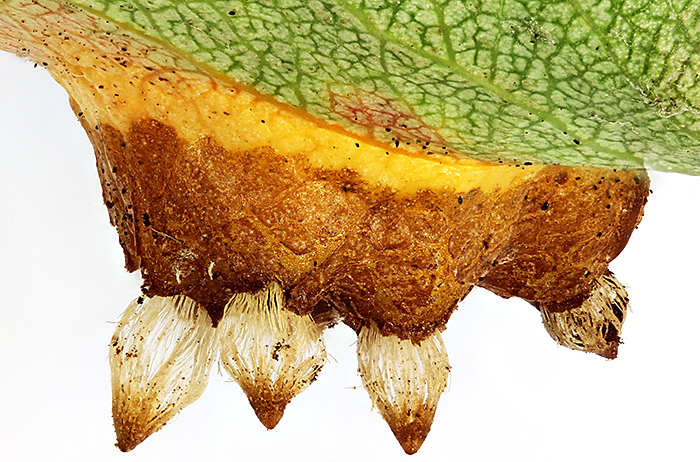 Even 2 cameras cannot do everything, so I took some specimens home for a closer look. 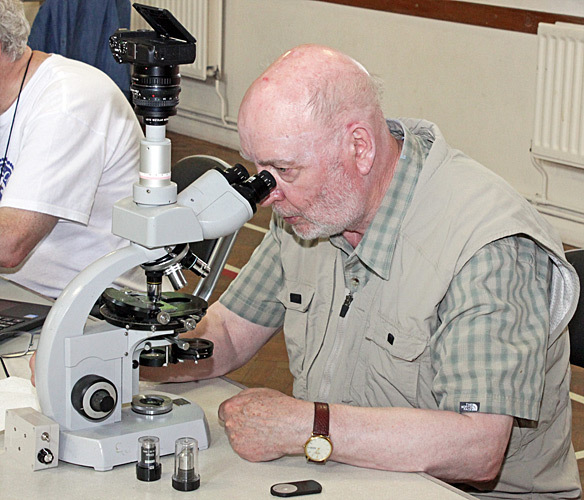 The excursion to Wimbledon Common is always interesting, with experts such as Graham Matthews and Tony Pattinson on hand to identify specimens and show the rest of us how to take photomicrographs. 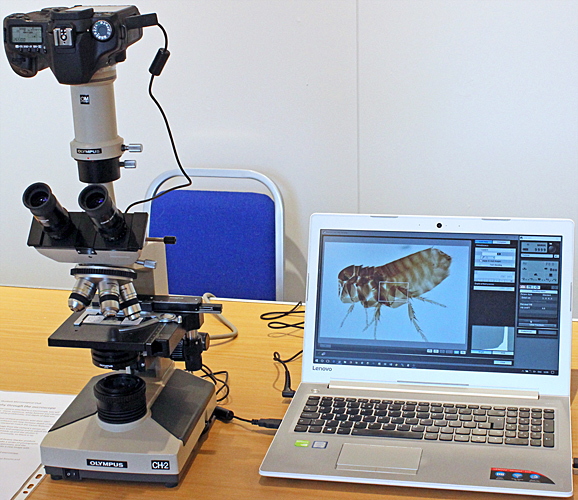 For the Quekett display at the Members’ Day and AGM of the Amateur Entomologists’ Society, I took my trinocular Olympus CH-2 compound microscope, Canon EOS digital SLR camera and Lenovo laptop computer to show how easy it is to take photomicrographs using the free EOS Utility software. 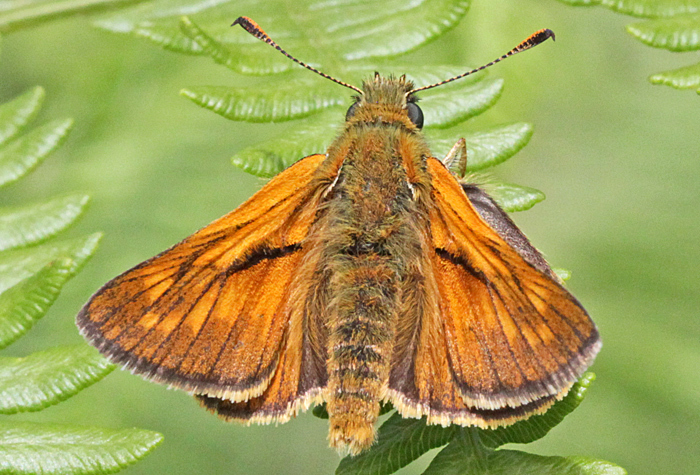 The image from the camera’s sensor is shown on the computer screen so that you can compose, focus, set white balance and adjust exposure. The camera’s mirror is up and its shutter is open, so there is no vibration. It had snowed for a few days before the South Thames Discussion Group so I didn’t want to carry a microscope on the icy pavements. 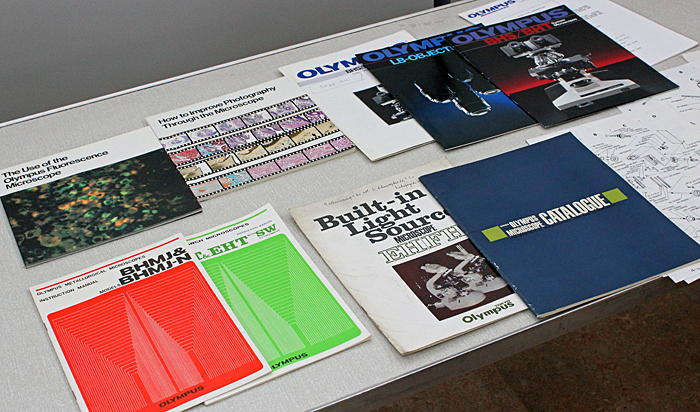 Instead, I took some of my collection of Olympus books, brochures, instruction books, exploded parts diagrams and repair manuals. 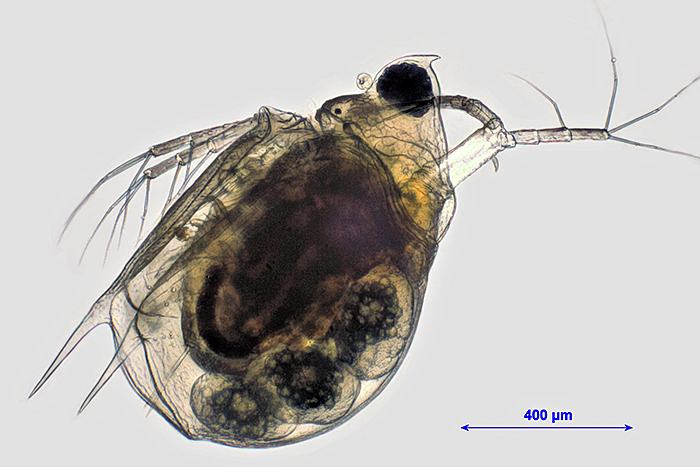 Lots of these are available as PDFs on the Internet, including from my own page of Olympus microscope documentation, but it is nice to have the original printed versions. 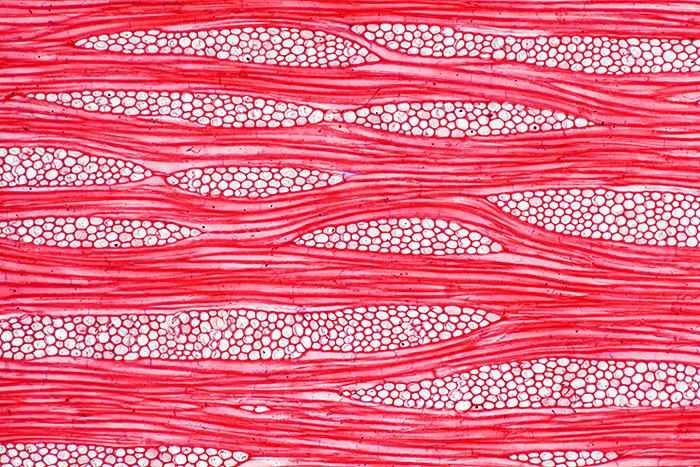 I submitted a photomicrograph of teak wood for the 2018 Royal Microscopical Society calendar but didn’t really expect to stand a chance against the professionals, so I was delighted that it was accepted. For the “My latest microscopical acquisition” gossip, I showed the Olympus VM-LSG Reflected Light Illuminator that I bought for just £3 at the AES Annual Exhibition in September 2017. 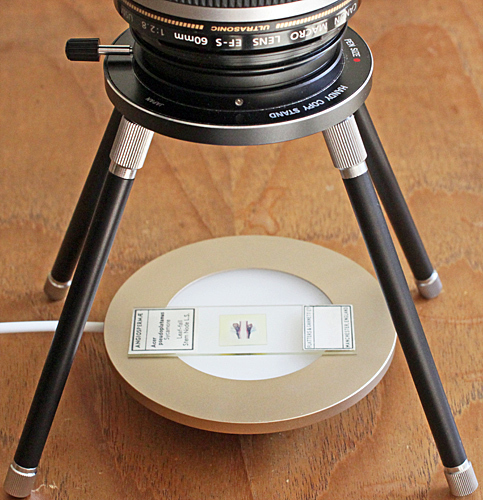 It is a very similar concept to the Bausch & Lomb Nicholas Illuminator, mountable on the transformer or on the stand of a stereomicroscope, and provides a bright focusable circle of light that is good for revealing surface structure. Although it appears to be tightly sealed, there is dust inside that is clearly visible in the focused spot; I have not yet worked out how to open it. The VM-LSG is present in only two of my collection of Olympus microscope documents, the VM brochure from 1980 and instructions from 1985. It is a nice illuminator, and it is a shame that there are not many of them around. 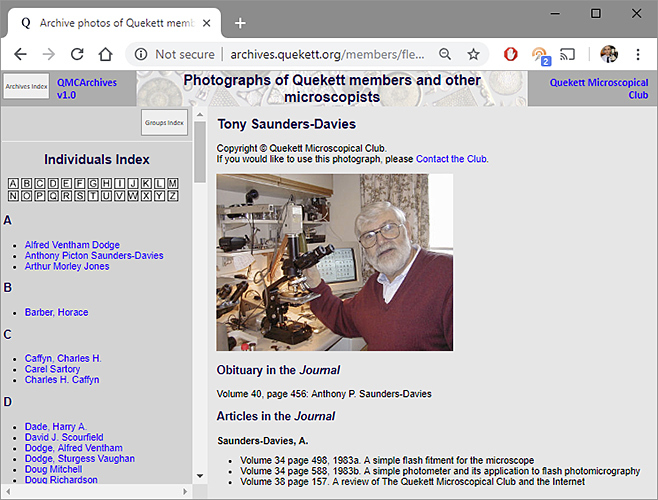 I am Alan Wood, webmaster for the Quekett website, and author of several web pages on Olympus microscopes. 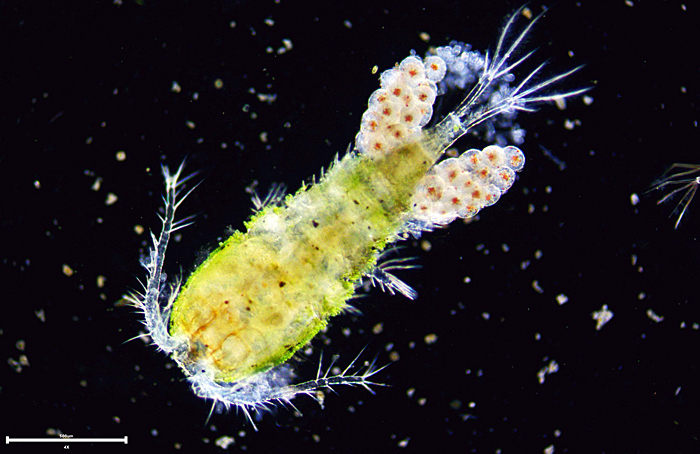 I spend too much time writing about microscopes and buying more equipment. 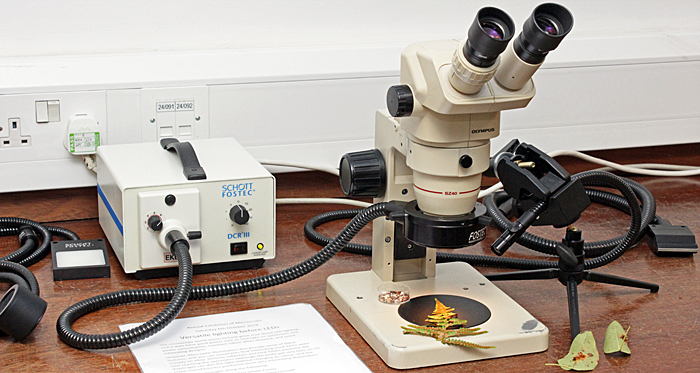 I hope this blog will help me to focus on using my microscopes so that I have something to write about! If you would like to comment on anything in this blog, please contact the Webmaster.